Like many startup businesses, Crystal is a 1-person shop. She designs, creates and manages her custom leather handbag business all by herself. In 2018, Crystal found herself overwhelmed with trying to figure out how to manage the digital side of her business. She knew that having an e-commerce website meant that she could have sustainable growth. Earlier on, Crystal used Wix to create her first website. She was on a budget and needed to have an online presence. At the time, Wix fit the bill. She used a basic template and put her best foot forward to create a shopping experience for her future customers. Crystal had ambitious goals for her website, but any potential revenue was continually slipping through the cracks. She had no idea why no one was buying from her site. No matter how much traffic was sent, no one bought. We later figured out that Wix was a bad business move (but more on that later). Crystal found 92DREAM through a mutual friend and there was an instant connection. 92DREAM sat with Crystal and after much analysis, we got down to the root of her problems: she needed a better e-commerce solution and a new design with a focus on conversion. When Crystal came to 92DREAM, we knew that she would be the perfect client for us. She was eager to learn about why her site wasn’t working and she was eager to fix it. To start off we conducted an initial website analysis (click here to check out the analysis that we created for her) that detailed all of the problems that her Wix site was having. After going through all of the problems we all came to the agreement that a site re-design and re-platform to Shopify would be needed in order set the foundation for future growth and establish an emphasis on search engine optimization. We started with research on the brand as well as research on competition using mood boards (see figure A). Crystal and our team would discuss each image and talk about why they were added and what we loved most about each. After creating a mental construct and establishing the tone we suggested creating wireframes for the entire website (see figure B). Wireframing would allow us to see exactly how elements would be placed on each page. Our goal was to create a website that would seamlessly guide users through the customer funnel and ultimately convert. After everyone agreed on the wireframes, we then designed the final layout for each page of the website. The site underwent a big change, but it was all to see further growth in the business (see figure C). The design was the least complicated part of the entire process. All along we made sure to pay attention to the small details and gave users transparency by adding a free shipping notification bar on every page. We let the users know their transaction is 100% secure in a clear spot right next to the ‘add to cart’ button. 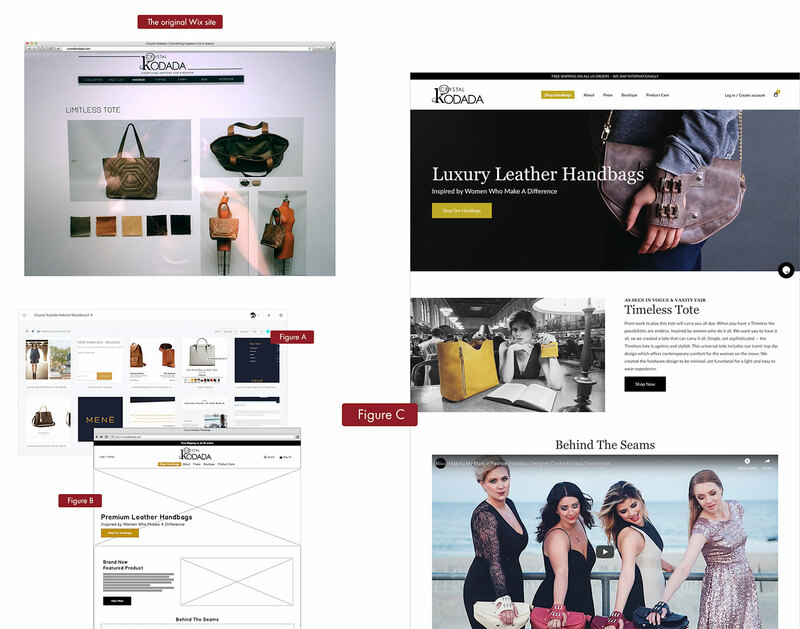 All of the initial research and preparation with the wireframes made this a very smooth process. Crystal is now relieved that she has a solid foundation to crush her future goals with her new Shopify e-commerce website. She can focus on other parts of her business knowing that her new site is going to deliver time and time again. Since implementing the website Crystal has had her best year ever in sales! Hiring 92DREAM was the best decision I ever made for my e-commerce business! I am an owner and designer for my luxury leather handbag brand, Crystal Kodada. I have been in business, for now, five years. My first few years of business I created my first website on WIX, and it fell very short. I was not making many sales, or getting traffic and the overall appearance was not professional, or at the level, it should be with our luxury product. What I needed was an expert with a high taste level in web design and development to take our online shop and brand to the next level. At the beginning of 2018, I hired Anthony Wallace owner of 92DREAM to design and develop my new website. Working with Anthony was terrific. He had a great personality and very organized and listened to every detail and vision that I wanted to execute for our e-commerce site. We worked on all the branding details, and wireframe of the site for a few months. Anthony took the time to build a solid foundation from the ground up on this site. Not only making sure the design and aesthetic were perfect but that all the backend and logistics were in place as well. He cared about my brand and the future goals for my business. What was beyond impressive was that Anthony custom coded our website on Shopify from scratch which is incredibly hard to achieve. Ask any web developer. When we launched our new website in June of 2018 everyone, myself included were in awe with how beautiful, unique, and professional the platform looked. It was my dream website! All the functions worked smoothly; it seemed terrific on any device. Most importantly the shopping checkout experience was seamless. It was a one of a kind website not even my biggest design competitors had. It’s been six months now that our website has been fully operating and I’m happy to report my online sales and traffic have increased 100% ever since. I was able to get a fast return on my investment as well which is HUGE for me being a small business. Hiring Anthony was the best decision I ever made for my company, and I’m so grateful for all his hard work! Anthony is passionate about what he does, and it comes through in his work. He has become like a friend to me, and I continue to work with him on building our online business for many more years to come!